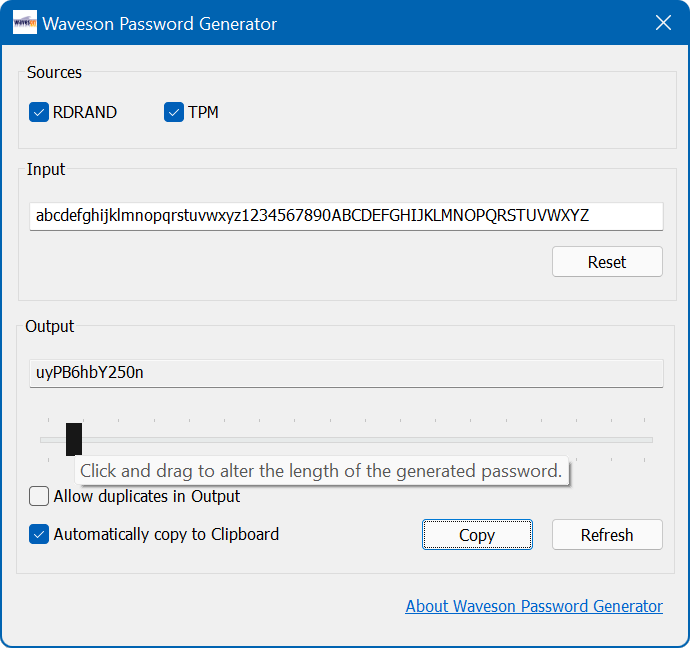 Waveson Password Generator is a Windows app which combines hardware-based sources of randomness with user-specified character sets to generate passwords of varying length. Waveson Password Generator runs on Windows 8.x/10 computers equipped with a Trusted Platform Module (TPM) and/or an Intel CPU which supports Intel® Secure Key (broadly: Intel® 3rd Generation Core™ processors, code-named Ivy Bridge, or newer). Waveson Password Generator works with TPM versions 1.2 and 2.0. Problems? Get in touch via Facebook, Google+ or Twitter (DMs are open!). The source code for Waveson Password Generator is available on GitHub. Copyright © 2017 Stephen Higgins. All rights reserved.